It’s summer time and that means our kids need to do something to keep them busy. Right, moms and dads? Well, if you want the little ones to enjoy the remaining days of their summer vacation (and thank you for it) without making a dent on your pockets at all, look no further! 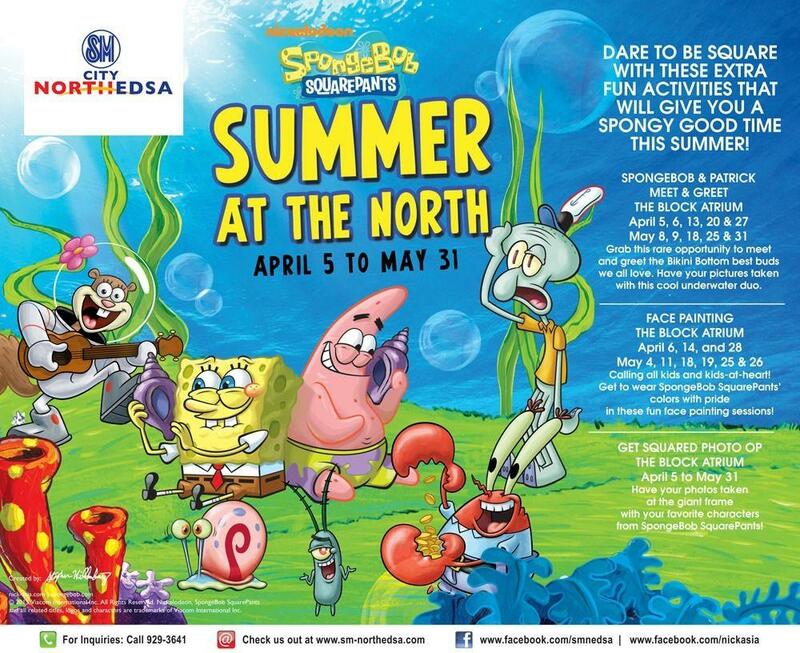 Our favorite yellow fellow makes a stop at the North as SM City North EDSA and Nickelodeon get together to deliver the happiest summer yet to kids of all ages in SpongeBob SquarePants Summer at the North. Let them enjoy and have fun in the exciting and exclusive SpongeBob activities. May 25, 2013: SpongeBob and Patrick Meet & Greet at The Block Atrium! Get to Meet and Greet the beloved best friends. Every P500 purchase of SpongeBob merchandise entitles one to spend time with the two fellows at 3pm or 5pm. May 25 & 26, 2013: Face Painting at The Block Atrium! Kids and kids at heart can wear SpongeBob SquarePants’ colors with pride at the Face Painting session from 3pm to 5pm. May 25-31, 2013: Get Squared Photo Op at The Block Atrium and at the Skygarden! The Block Atrium is transformed into an underwater city inspired by the Bikini Bottom. Mallgoers can take a tour of SpongeBob’s Pineapple House, be amazed at his exquisite furniture and décor, and even get to meet his pet snail, Gary. Your cute little rascals will also get to visit the famous Krusty Krab and experience for yourself where SpongeBob works and constantly tries to vie for the employee of the month award. And if you love Squidward, his house on the other hand, which resembles an Easter Island moai, welcomes water lovers with soaking sound effects giving them an underwater feel of Bikini Bottom. The SM City North EDSA Skygarden will also be delighted with the SpongeBob SquarePants theme, giving mallgoers more reasons to enjoy the summer breeze as they stroll along its walkway. Skygarden ponds will display SpongeBob’s Pond, Patrick Star’s Pond, and the Jellyfish Fields while SpongeBob SquarePants will wow everyone at the waterfalls. So, what are you waiting for! Go North and catch the Sponge!!! You are Here >> Home » Sponsored » SpongeBob SquarePants Summer at the North!